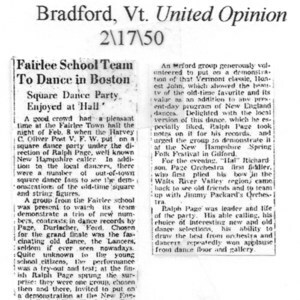 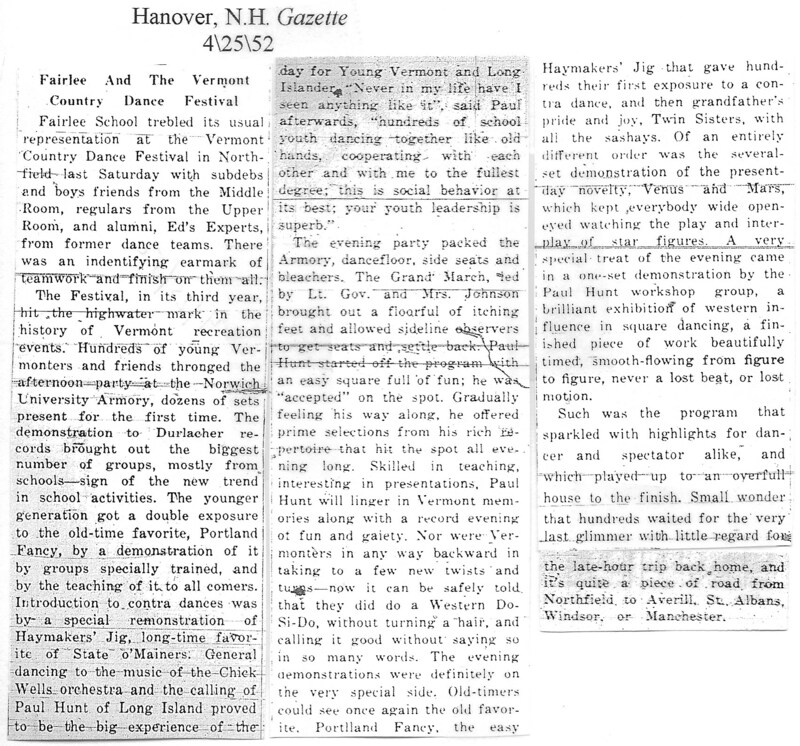 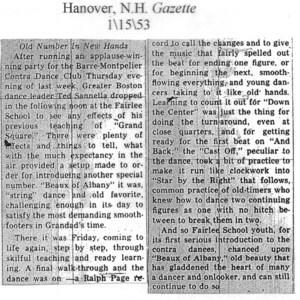 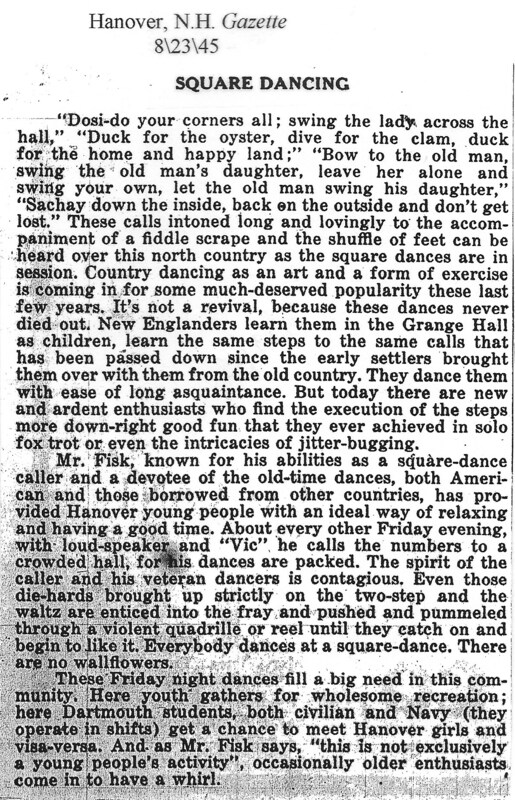 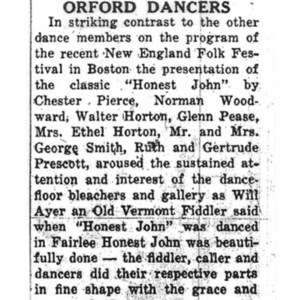 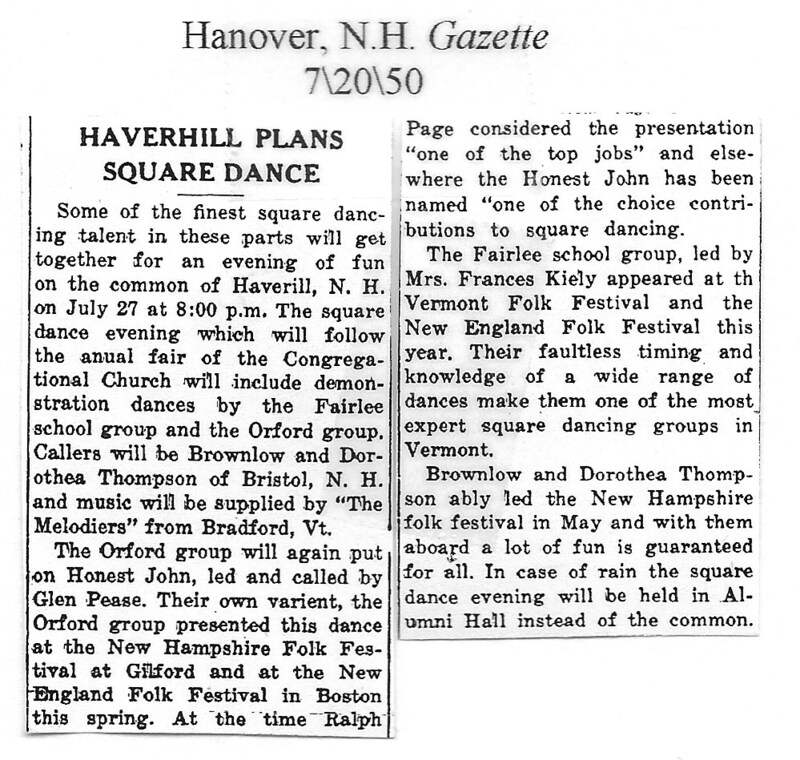 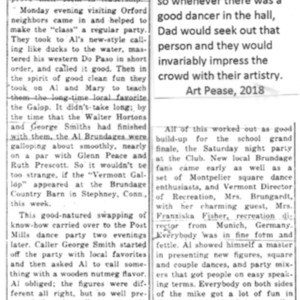 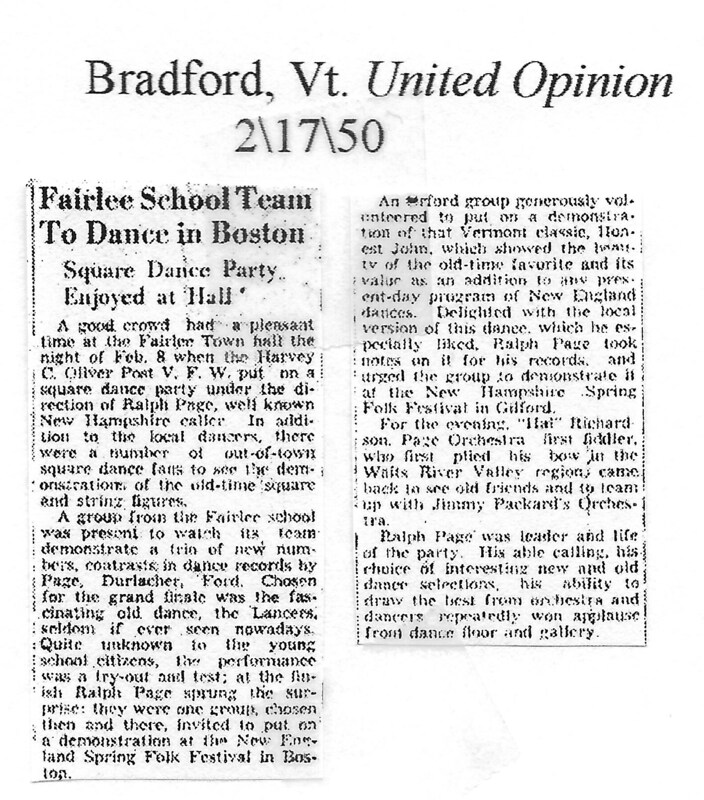 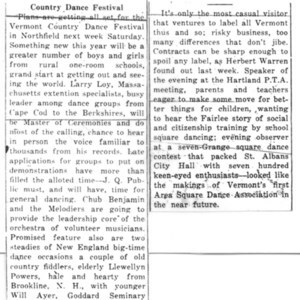 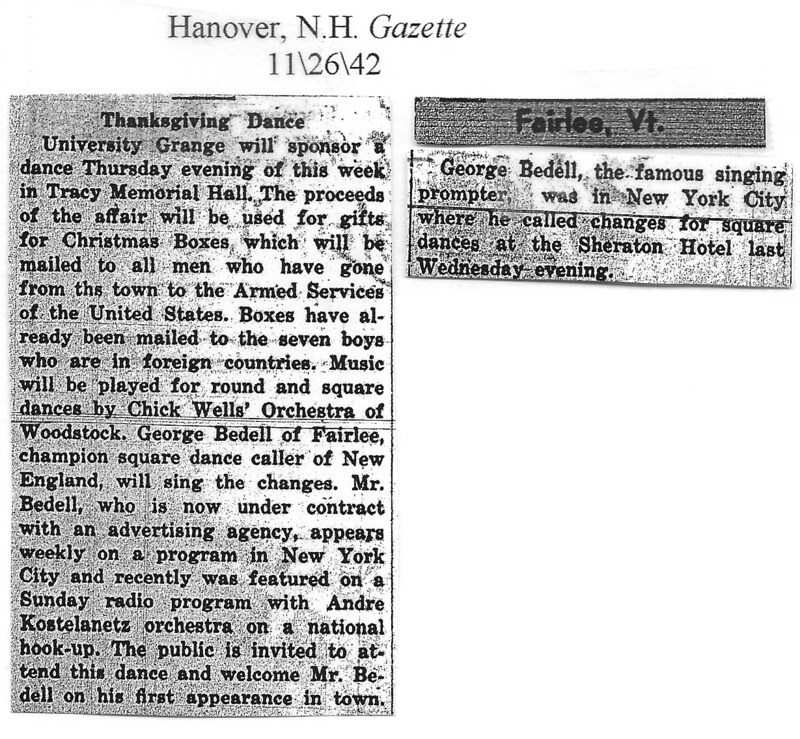 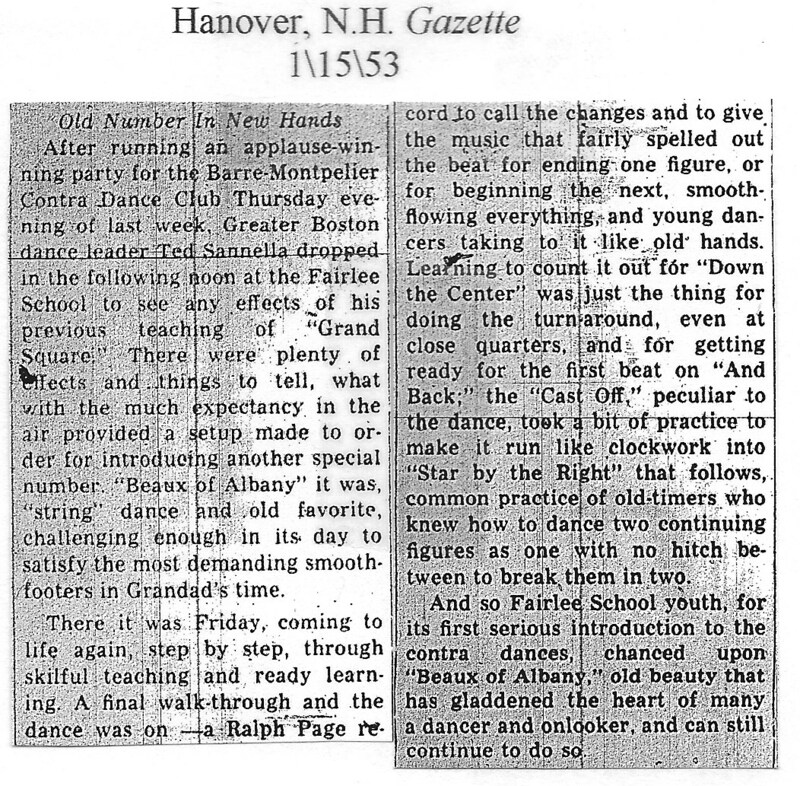 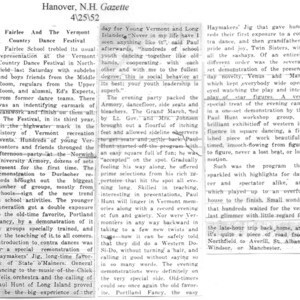 This is a collection of articles from the Hanover (NH) Gazette and the Bradford (VT) United Opinion, reporting on square dances in the area (New Hampshire and Vermont) in the 1940s and early 1950s. 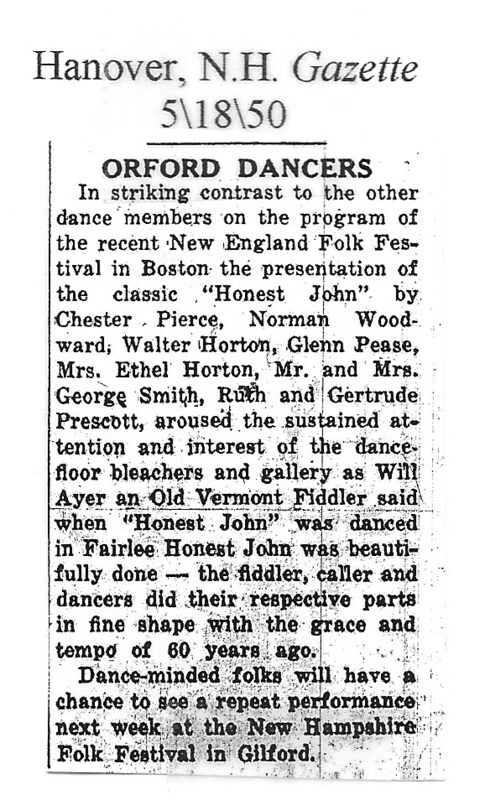 Chester Fisk, mentioned in several of the early articles, was a Hanover minister and dance leader. 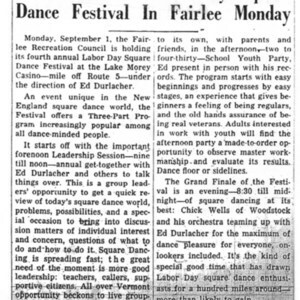 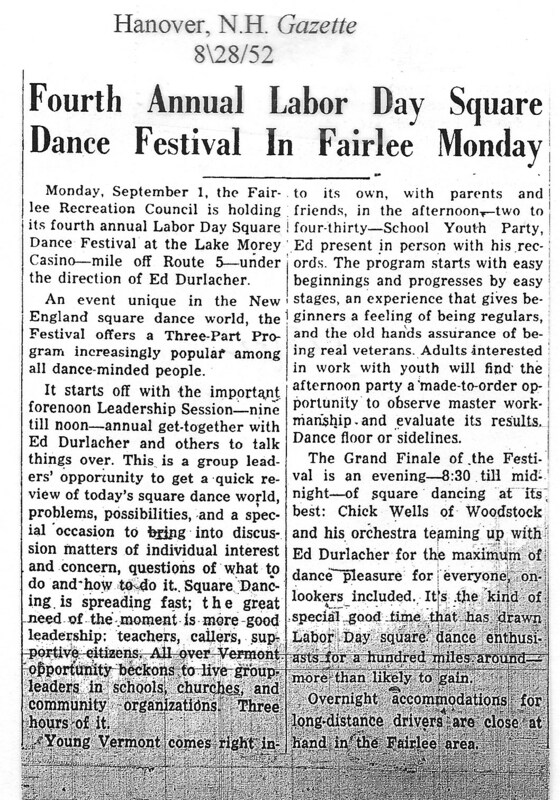 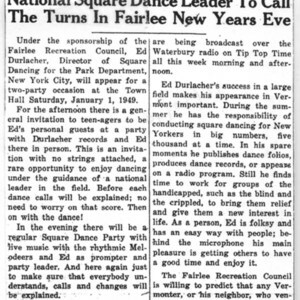 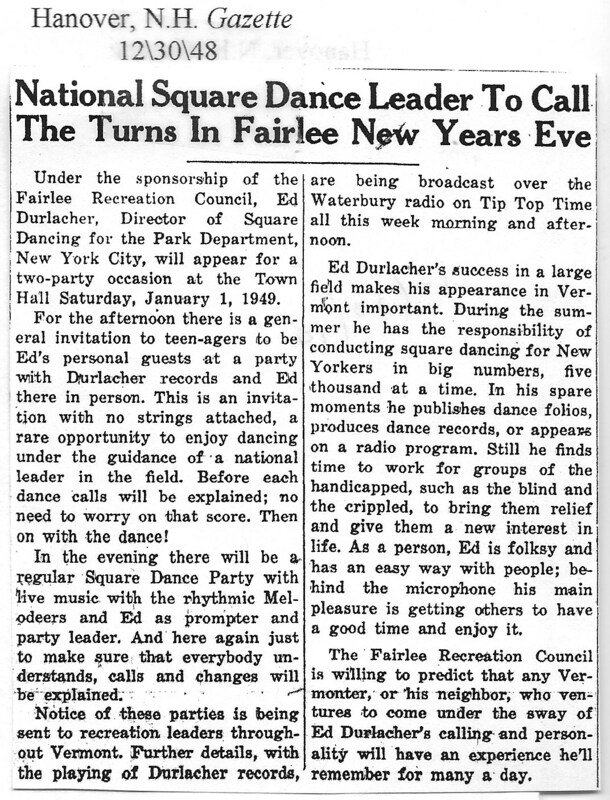 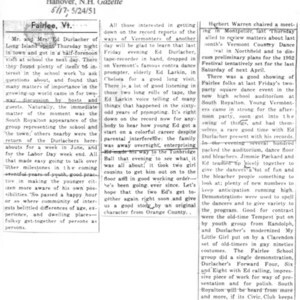 Many of the later stories include references to New York caller Ed Durlacher, who made repeat visits to the area, including coaching elementary students on square dance teams in Fairlee, Vermont. 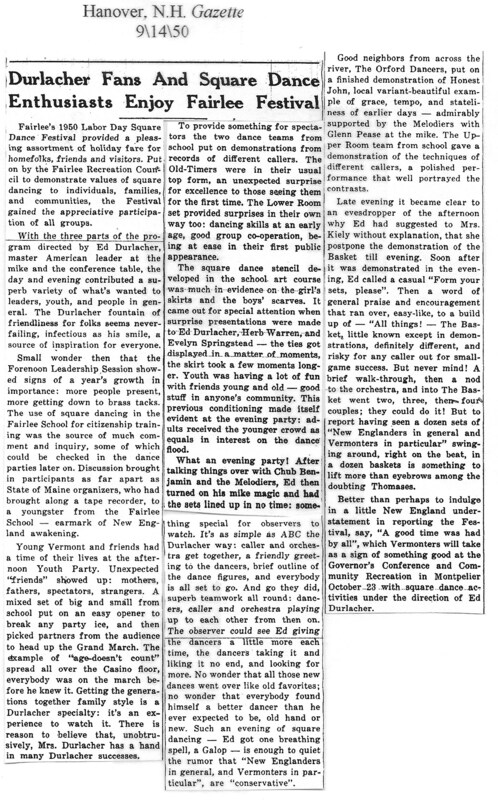 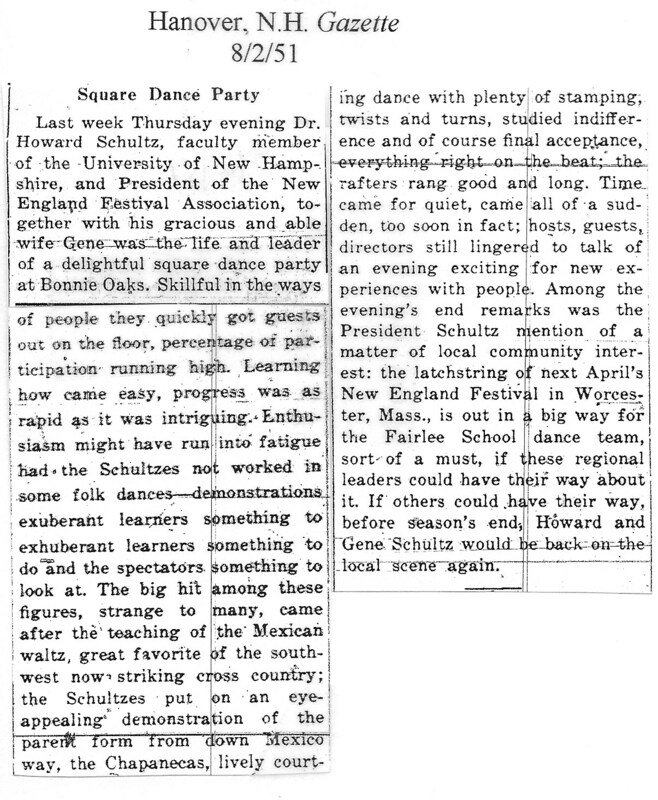 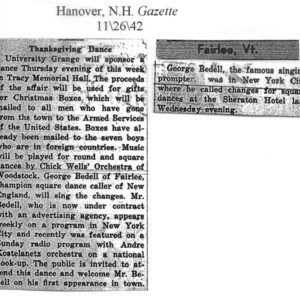 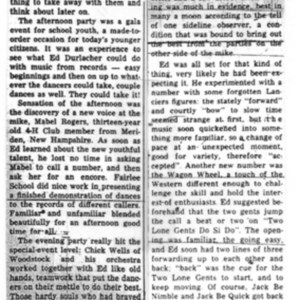 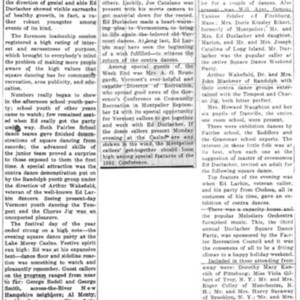 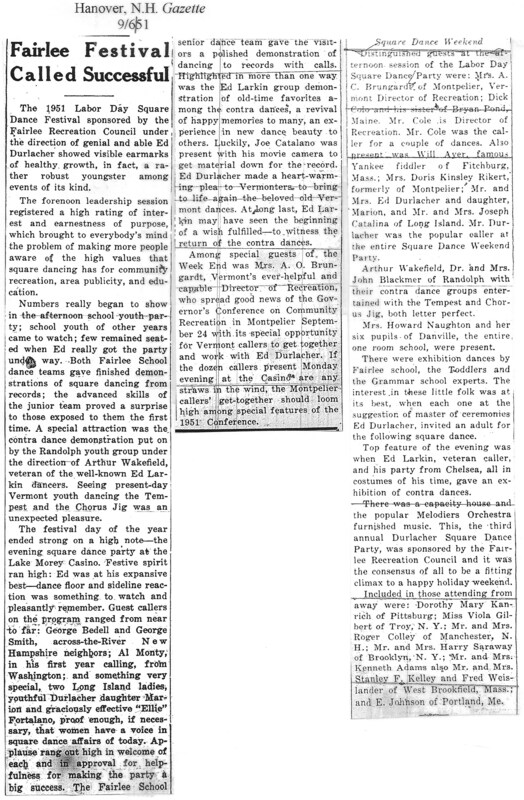 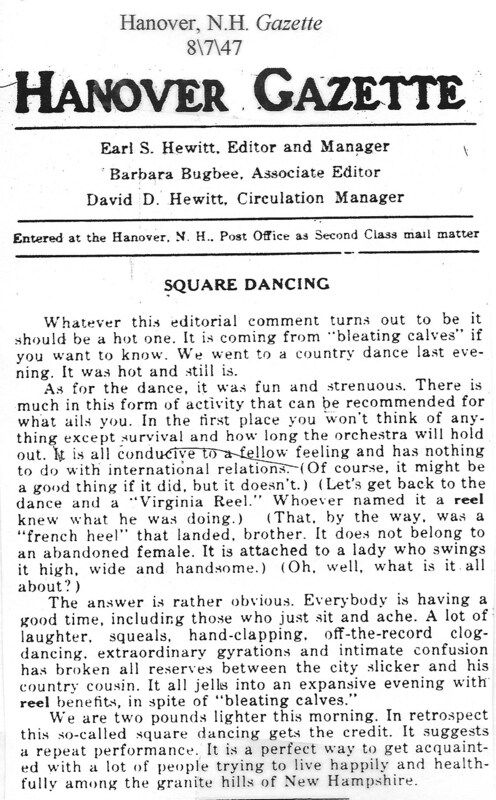 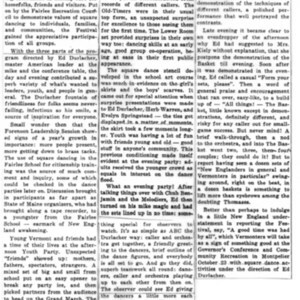 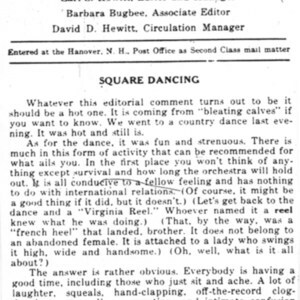 The 1947 editorial (third item) was written the day after attending a square dance. 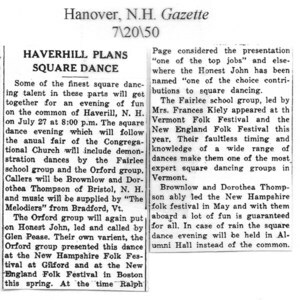 The author concludes: "It is a perfect way to get acquainted with a lot of people trying to live happily and healthfylly among the granite hills of New Hampshire." 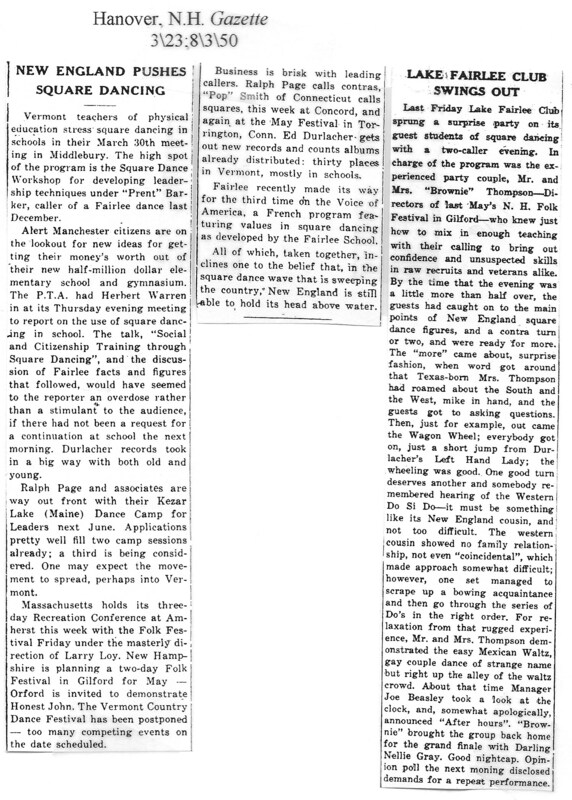 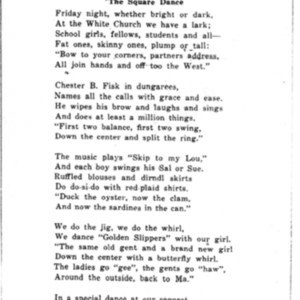 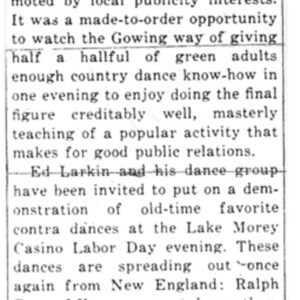 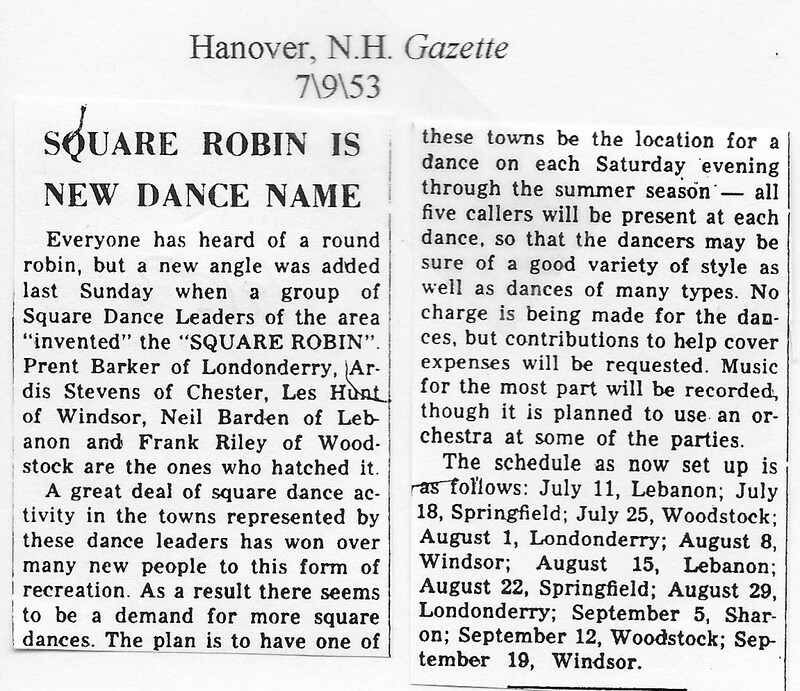 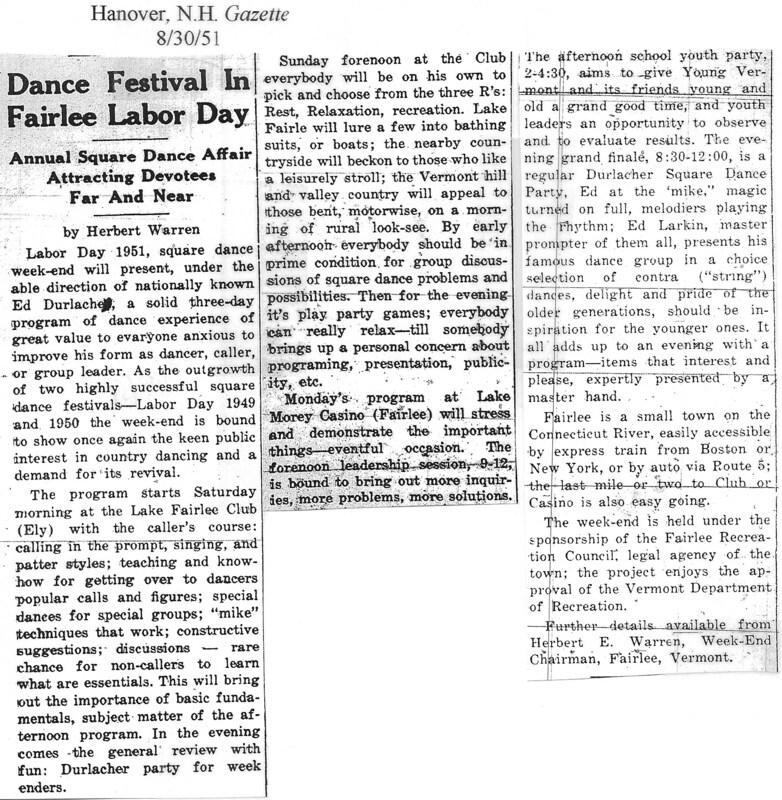 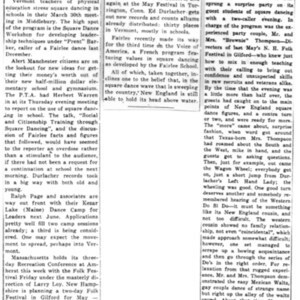 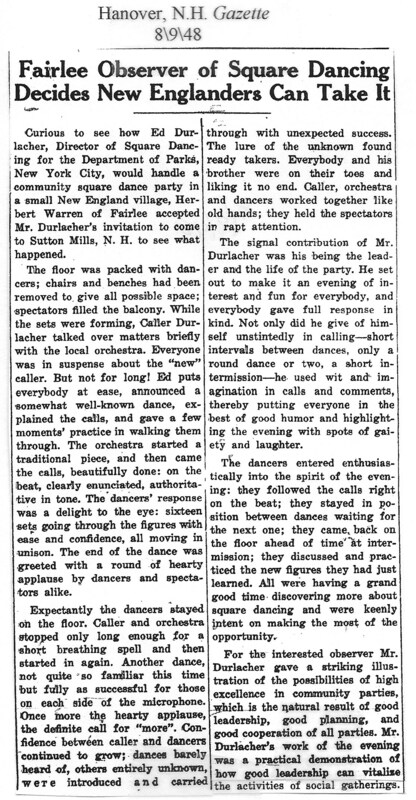 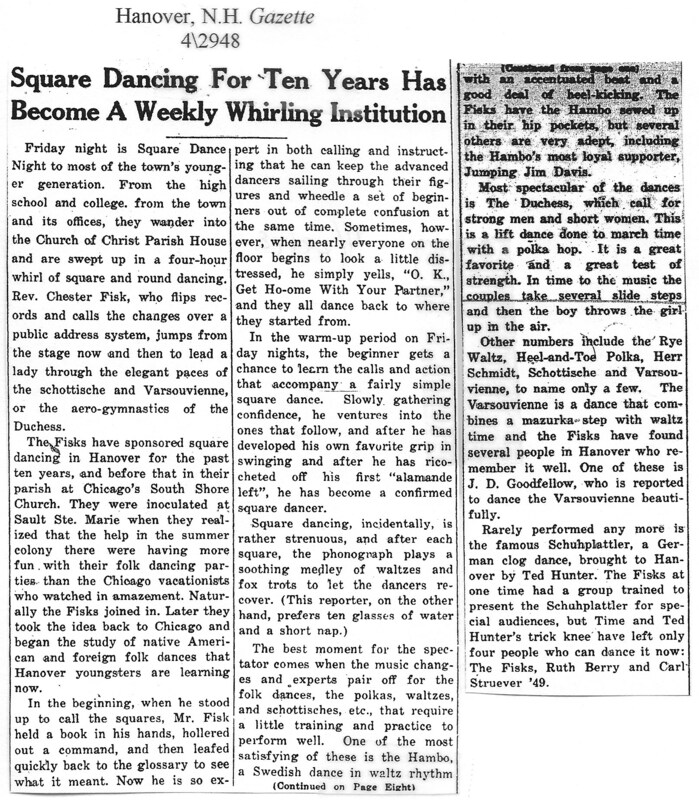 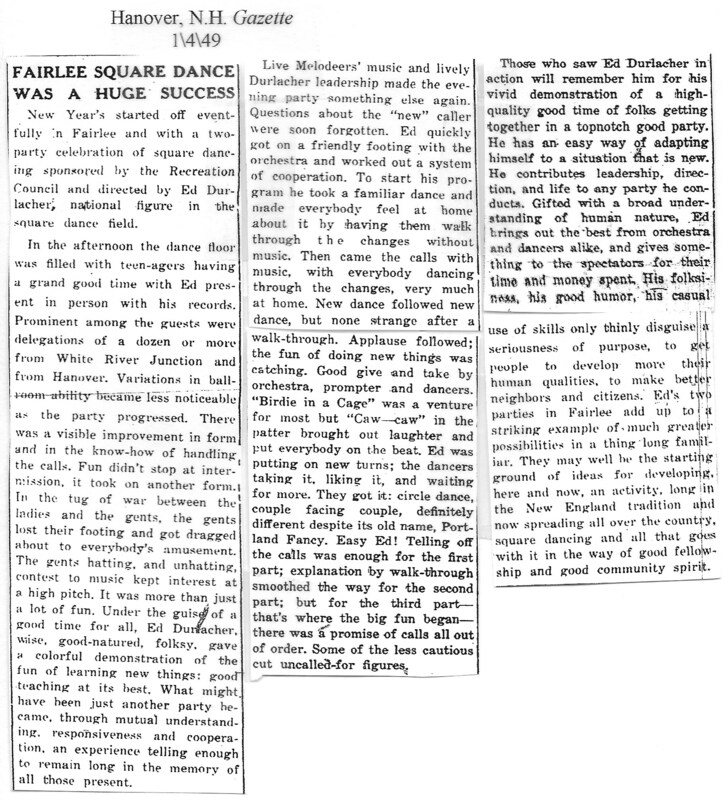 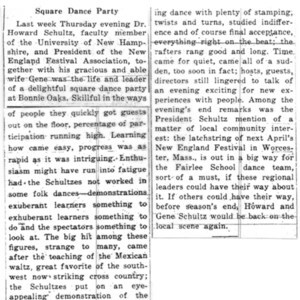 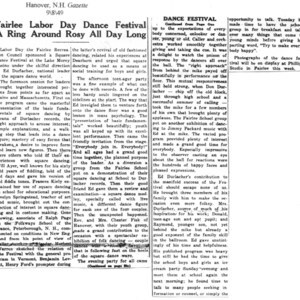 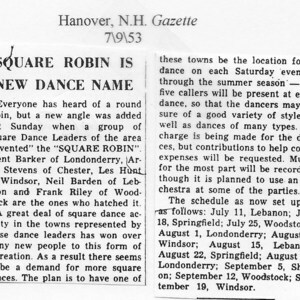 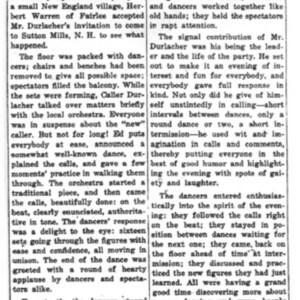 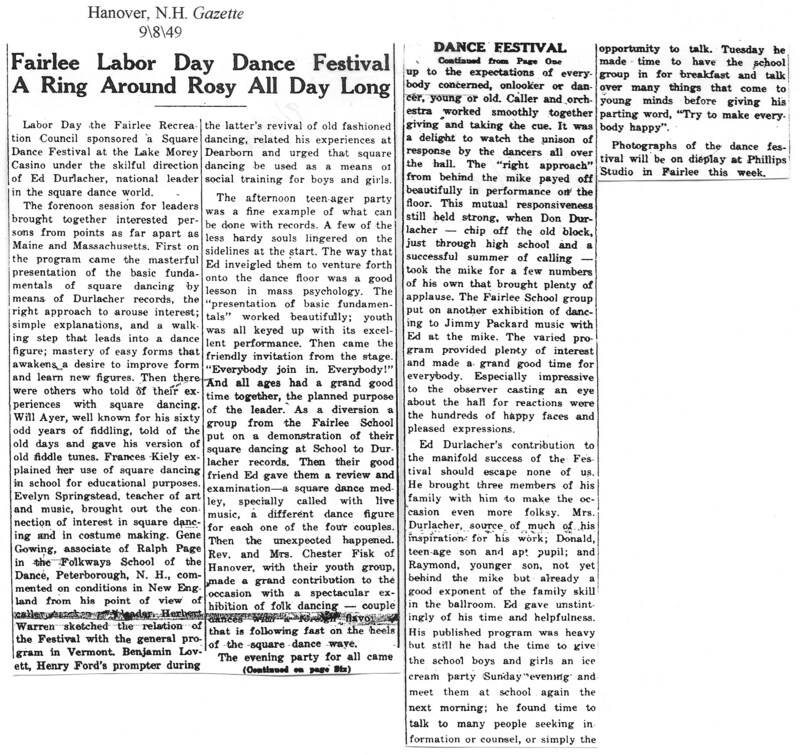 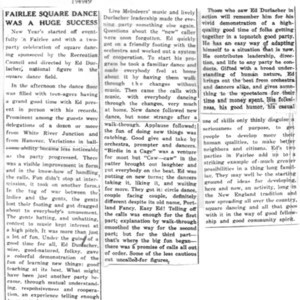 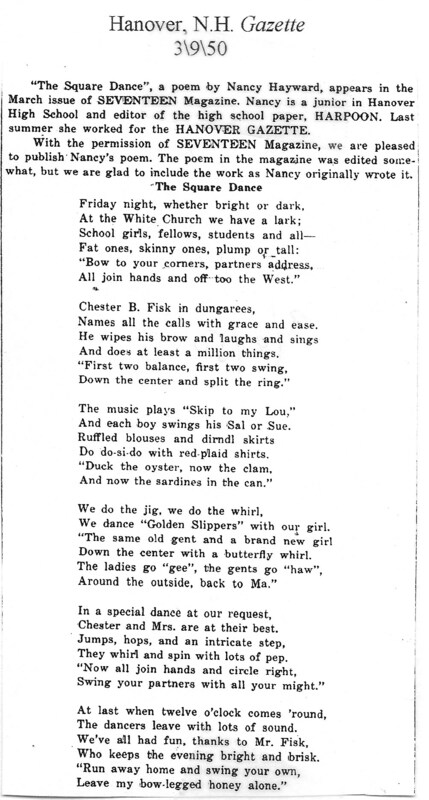 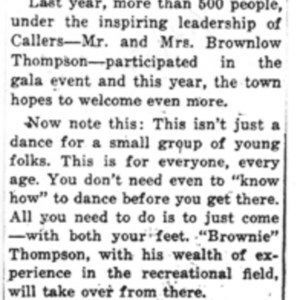 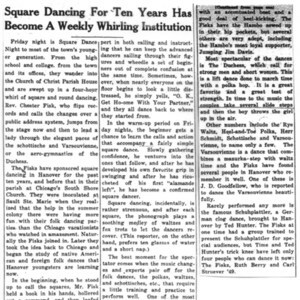 A later article in 1953 describes a new summer series of weekly dances held in different towns. 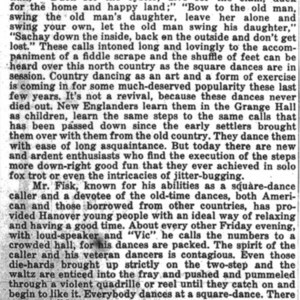 Five area callers agreed to be present at all events, giving dancers in each location an opportunity to enjoy different dances and styles of calling. 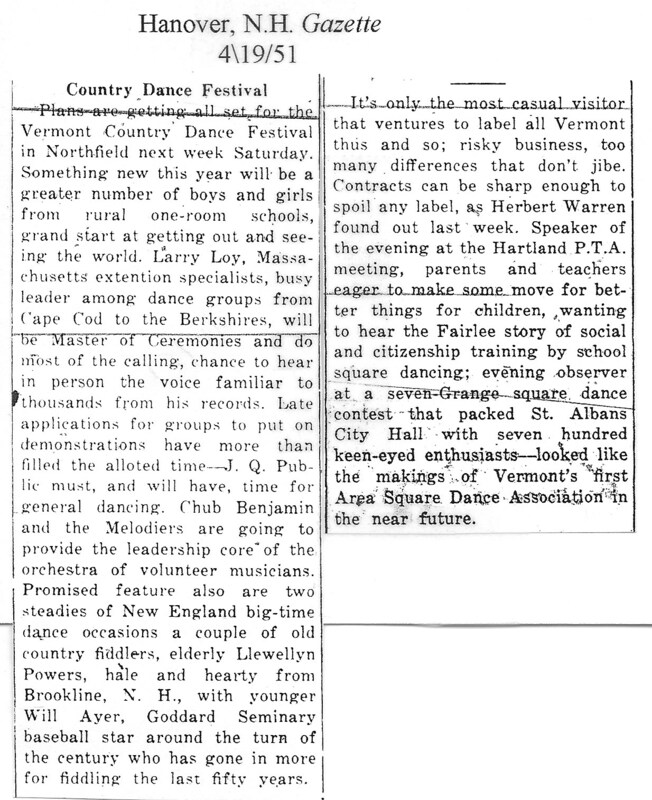 The clippings were located by Art Pease, son of square dance caller Glenn Pease. 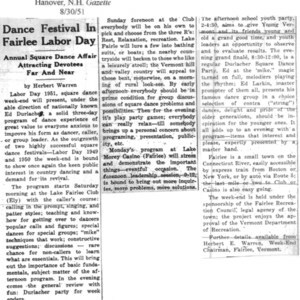 CLicking on the Additional Files will bring up an 11-page PDF file with transcriptions of newspapers and photographs centered on the same region during the 1940s and 1950s. 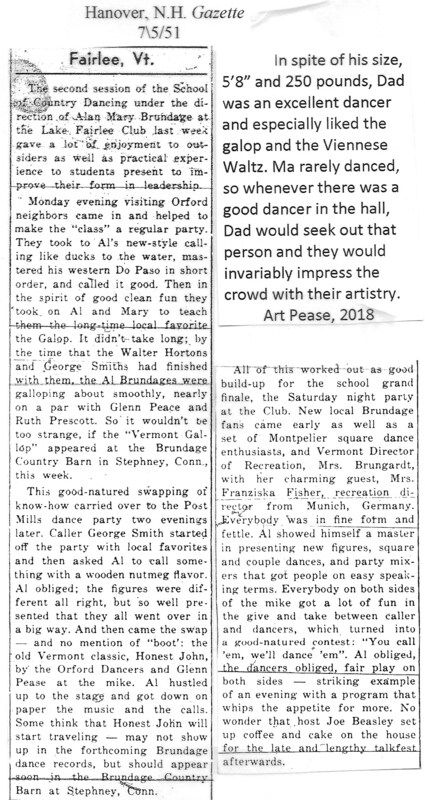 Fairlee, Vermont, and Orford, New Hampshire, lie across the Connecticut River from each other. 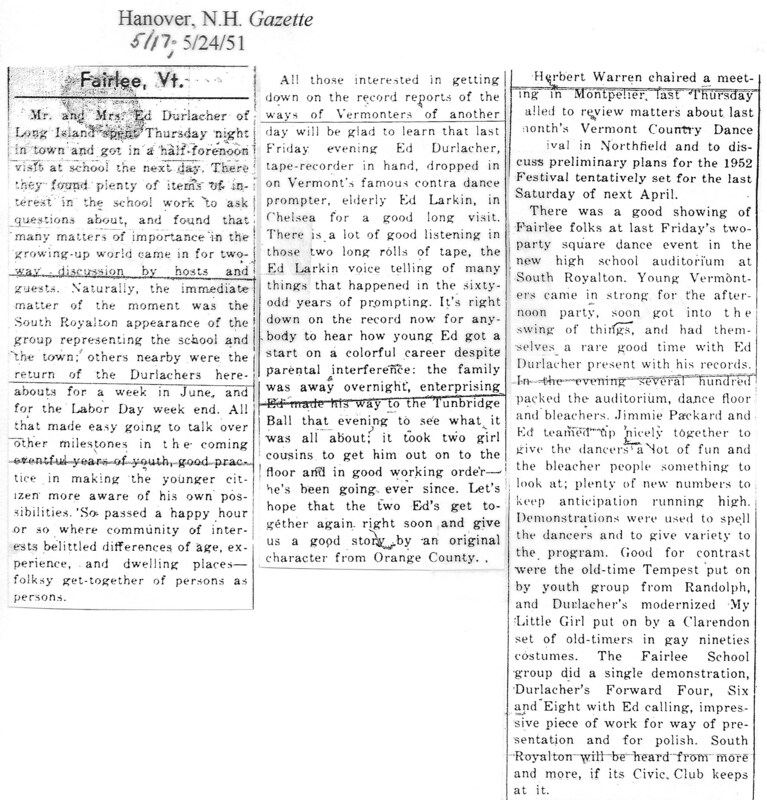 Many of the items in this collection relate to caller George Bedell. 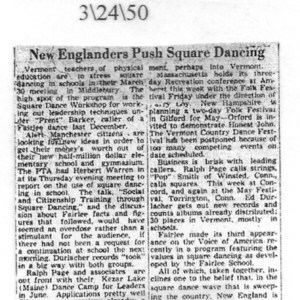 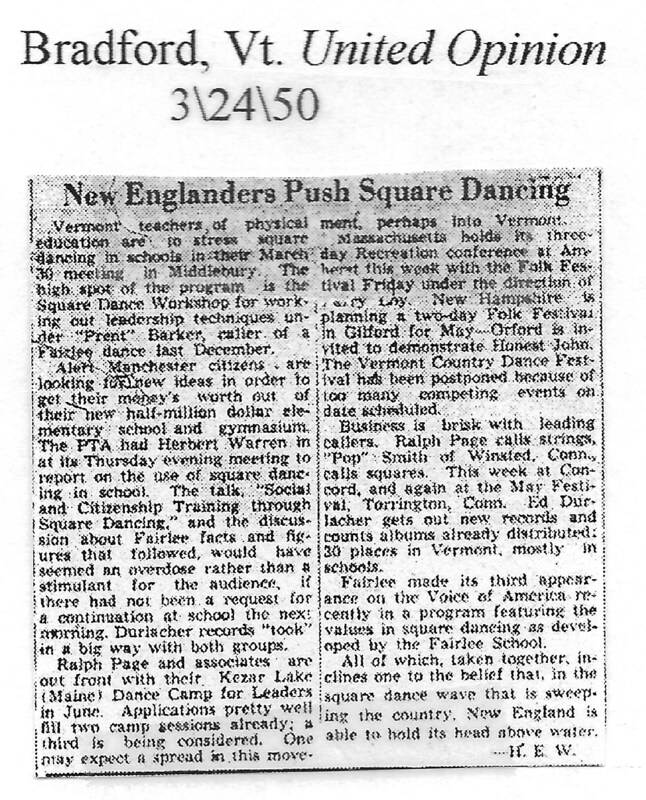 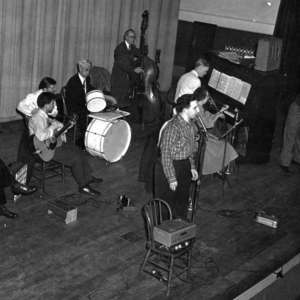 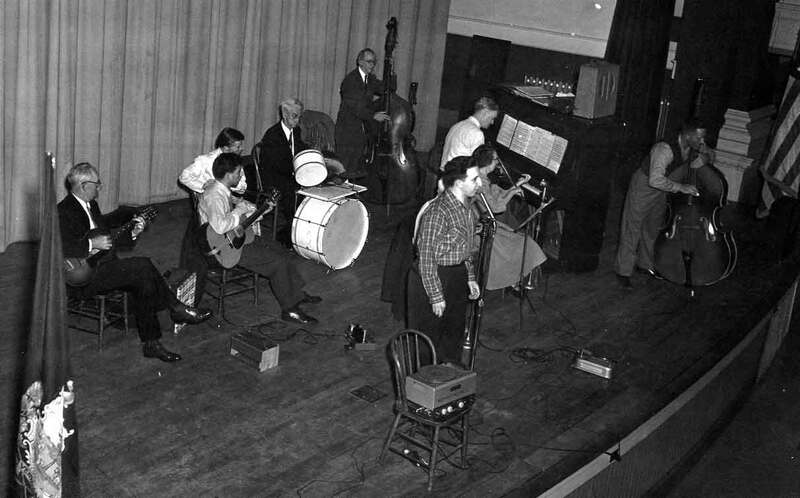 “NH/VT squares, 1940s & 1950s,” Square Dance History Project, accessed April 24, 2019, http://squaredancehistory.com/items/show/1759.